For the battle itself, see Battle of Quebec (1775). The Death of General Montgomery in the Attack on Quebec, December 31, 1775 is an oil painting completed in 1786 by the American artist John Trumbull depicting the death of the American general Richard Montgomery at the Battle of Quebec on December 31, 1775, during the invasion of Quebec, a major military operation by the Continental Army in the American Revolutionary War. The painting is on view at the Yale University Art Gallery in New Haven, Connecticut. It is the second in Trumbull's series of national historical paintings on the war, the first being The Death of General Warren at the Battle of Bunker's Hill, June 17, 1775. Trumbull went to London in 1784 to study painting with Benjamin West, historical painter to King George III. West, himself famous for such paintings as The Death of General Wolfe, suggested that Trumbull paint great events of the American Revolution. The first was The Death of General Warren at the Battle of Bunker's Hill, June 17, 1775, started in the fall of 1785 and finished early in 1786. The second was this painting, which was finished in June 1786. Both were painted in West's London studio. In July 1786, Trumbull traveled to Paris and stayed at the Hôtel de Langeac at the invitation of Thomas Jefferson, who was then the American minister to France. Jefferson gave "his warm approbation" to these two works and assisted Trumbull with the early composition of the Declaration of Independence. General Richard Montgomery is shown in full military uniform, illuminated in the middle of the painting, having been fatally wounded by grapeshot and supported by Matthias Ogden. In front of them are two of Montgomery's aides-de-camp, Captains Jacob Cheeseman and John MacPherson, both dead, lying in the snow, near a broken cannon. Behind Montgomery and Ogden are Lieutenant Samuel Cooper and Lieutenant Colonel Donald Campbell. To the left are Lieutenant John Humphries and Oneida chief Joseph Louis Cook (also known as "Colonel Joseph Louis"), shown with raised tomahawk. Major Return Jonathan Meigs with Captains Samuel Ward and William Hendricks are in the left foreground shown in shock at Montgomery's death. On the far right is Colonel William Thompson of the 1st Pennsylvania Regiment. Art historian Paul Staiti notes that Ogden was with Benedict Arnold attacking a different part of the city during the battle and that Aaron Burr, Montgomery's aide-de-camp, should have been depicted instead. Historian Nancy Isenberg notes evidence that Burr had attempted to retrieve the general's body, but also notes doubts about its accuracy. Grief and surprise mark the countenances of the various characters. The earth covered with snow,–trees stripped of their foliage,–the desolation of winter, and the gloom of night, heighten the melancholy character of the scene. A large scale version (72 1⁄2 inches (184 cm) x 108 1⁄16 inches (274.5 cm)) painted in 1834, is owned by the Wadsworth Atheneum in Hartford, Connecticut. Johan Frederik Clemens engraved a version, The Death of General Montgomery, In the Attack of Quebec, December 1775, in 1798. Christian Wilhelm Ketterlinus [de] engraved a version, The Death of General Montgomery at Quebec, published in 1808, copied from a print by Clemens. The composition of this work has been compared to West's The Death of General Wolfe, completed in 1770, that depicts the Battle of the Plains of Abraham, also at Quebec City, on September 13, 1759. Both show the death of heroic generals. The influence of two works by John Singleton Copley, The Death of the Earl of Chatham (1781) and The Death of Major Peirson, 6 January 1781 (1783), has also been noted. ^ Cooper, Helen A. (2008). Life, Liberty, and the Pursuit of Happiness: American Art from the Yale University Art Gallery. New Haven, Conn.: Yale University Art Gallery. pp. 84–5. ISBN 978-0-300-12289-3. ^ Trumbull, John. 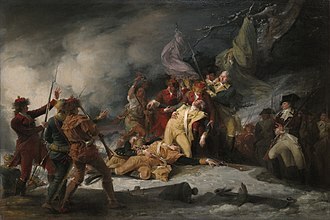 "The Death of General Montgomery in the Attack on Quebec, December 31, 1775". Yale University Art Gallery. ^ a b Trumbull, John (1841). Autobiography, Reminiscences and Letters of John Trumbull, from 1756 to 1841. New York: Wiley and Putnam. p. 93. ^ Barratt, Carrie Rebora. "Students of Benjamin West (1738–1820)". Metropolitan Museum of Art. West met King George III, who appointed him a charter member of the Royal Academy of Arts in 1768 and by 1772 made him his historical painter. ^ a b c Staiti, Paul (2016). Of Arms and Artists: The American Revolution through Painters' Eyes. Bloomsbury Publishing. pp. 188–190. ISBN 978-1-63286-465-9. ^ Adams, William Howard (2000). The Paris Years of Thomas Jefferson. pp. 90–2. ISBN 978-0-30008-261-6. ^ Trumbull (1841), pp. 95–6. ^ "The Death of General Montgomery in the Attack on Quebec, December 31, 1775". Yale University Library. ^ Isenberg, Nancy (2007). Fallen Founder: The Life of Aaron Burr. Penguin Publishing Group. pp. 22–28. ISBN 978-1-101-20236-4. ^ Trumbull, John (1835). "No. 5.–The Death of Gen. Montgomery, in the Attack of Quebec". Catalogue of Paintings, by Colonel Trumbull; Including Eight Subjects of the American Revolution, with Near Two Hundred and Fifty Portraits of Persons Distinguished in That Important Period. Painted by Him from the Life. Gallery of Yale College. pp. 11–14. ^ "The Death of General Montgomery in the Attack on Quebec, December 31, 1775". Wadsworth Atheneum. ^ "The Death of General Montgomery, In the Attack of Quebec, December 1775". Museum of Fine Arts, Houston. ^ "The Death of General Montgomery at Quebec La mort du General Montgomery devant Quebec". Library of Congress. ^ McNairn, Alan (1997). Behold the Hero: General Wolfe and the Arts in the Eighteenth Century. p. 211. ISBN 978-0-77356-643-9. ^ "Death of General Montgomery in the Attack of Quebec (Engraving)". Thomas Jefferson Foundation.